It's often thought that hermit crabs live only a few years, but that doesn't have to be the case. With proper care and diet, some species of hermit crabs can live up to 30 years. In captivity, they do not have the same predatory threats they would have in nature -- so pet hermit crabs can live even longer. Habitat -- How you house hermit crabs will greatly affect how long they live. Hermit crabs do best in glass or acrylic aquariums decorated with branches, empty shells and plants. Keep the humidity between 70 percent and 80 percent, and maintain a habitat temperature of 75 to 85 degrees Fahrenheit. Diet -- A healthy diet will ensure longer life. Feed hermit crabs fruits and vegetables such as berries, corn and carrots, and nuts and seeds. You can offer commercial pellet diets, but don’t make them your hermit crabs' main source of food. 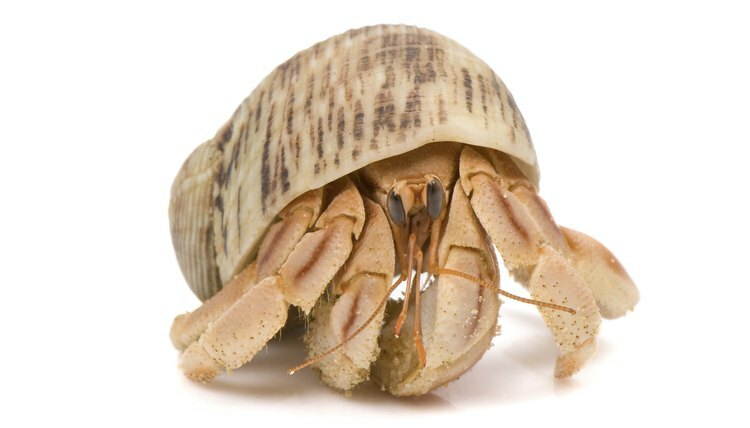 Shells -- Because hermit crabs move from shell to shell as they grow, they need empty shells to choose among. Make sure you have various sizes and shapes available. Without a suitable shell the next size up, hermit crabs may be reluctant to leave the shells they're in, which will cause them to grow more slowly, diminishing their potential longevity. Hermit Crab Facts: Hermit Crab Life Span – How Long Do Hermit Crabs Live as Pet?